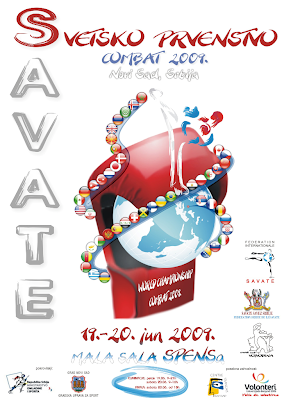 This year, specifically on this day, a World Championship in Savate Combat took place in Novi Sad, Serbia. The President of the FIS, Gilles Le Duigou and Mr Alain Guillard visited the Serbian federation in order to sign the convention of organization of the World Combat Championships, to be held June 18th,19th and 20th in Novi Sad. They also visited the proposed competition venue and the hotels (3 star) where participants will stay - they were pleased to establish the high standards. This World Championship will be a World Championship of high quality, due both to the number of countries participating and to the quality of the organization. Following the qualifying tournament for the finals of the 2009 world championship that took place last week-end (20th June), there are 15 senior finals for men and women, to be distributed among the candidate organisers. As 30 finals have been requested, some candidates may be disappointed! The Competition Commission will meet in July, before the summer holidays. Savate combat championships are every year harder and punches and kicks are stronger. Everybody in martial art world wants to compete against brilliant and well prepared French team. And every year new boxers, new muay thai fighters, new savate beginners try their best to win in attractive fighting discipline in shoes. Believe me - it is not easy to face 203 cm tall Ivo Debelic or massive attacker Aurieng or Borovic with nearly 200 fights ahead. In 2009 everybody can say without a shame: If you wanna compete in combat you should really have strong national team, strong financial support in your country and strong will to just step in ring with the best world fighters. And let's see what kind of support has the best team. Mariko Hara (Japan) vs. Valentina Balazinec (Croatia) - Women's savate combat -52 kg, winner: Hara. Mariko Hara (Japan) vs. Heloise Thouroude (France) Broken nose bone - Heloise. BENBALA Safia vs. GLISSET Ahlem - Women's savate combat -60 kg, winner: Glisset.